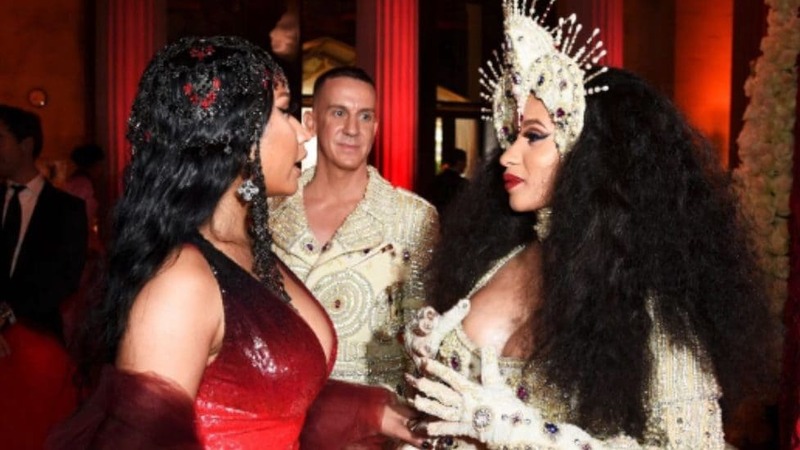 And at last night’s extravagant ode to over-the-top couture at the 2018 Met Gala, the stars aligned and Cardi B and Nicki Minaj put their beef on ice and were seen speaking to one another, E! reports. We have to mention that Cardi said if she sees you and doesn’t speak then you know what that means. So apparently Cardi B does eff with Nicki because the two were chopping it up and we are so here for the new-found friendship! A very pregnant Cardi B attended the ball with Jeremy Scott. Nicki is a good friend of Scott and he may have been the one to make that black girl magic moment happen. We imagine that Minaj was telling Cardi about all the latest Barbies she needs to cop for her new babyZ—if it’s a girl—and all the fluffy pink accoutrements that she needs to buy to go along with the doll. So maybe the convo didn’t go that way but we can dream. This year’s theme of the Met Gala was “Heavenly Bodies: Fashion and the Catholic Imagination,” and Cardi was extra glamorous and bedazzled in Moschino. Cardi wore a choker, sparkling jeweled headpiece and her gown was covered in ruby and sapphire stones. The mother-to-be was looking heavenly. Minaj was smoking red-hot in Oscar De La Renta. She said she picked this look because she wanted to play the more sinful side of the gala’s theme.